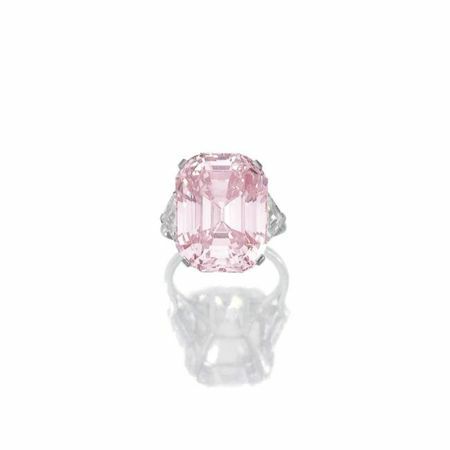 La vente record de ce soir conclue cette journée de vente avec un total de 103.421.800 CHF/ 105.051.728 US$, un record mondial pour une vente de haute joaillerie, dépassant largement les estimations (65.815.500 – 95.308.500 CHF). Des enchérisseurs du monde entier se sont affrontés dans une enchère vendue à 82% par lots et 94% par valeur. Des prix exceptionnels ont également été réalisés pour d’importants diamants blancs, des pierres de couleur rares, des bijoux d’illustre provenance et des bijoux signés par les plus grandes maisons. AFP. 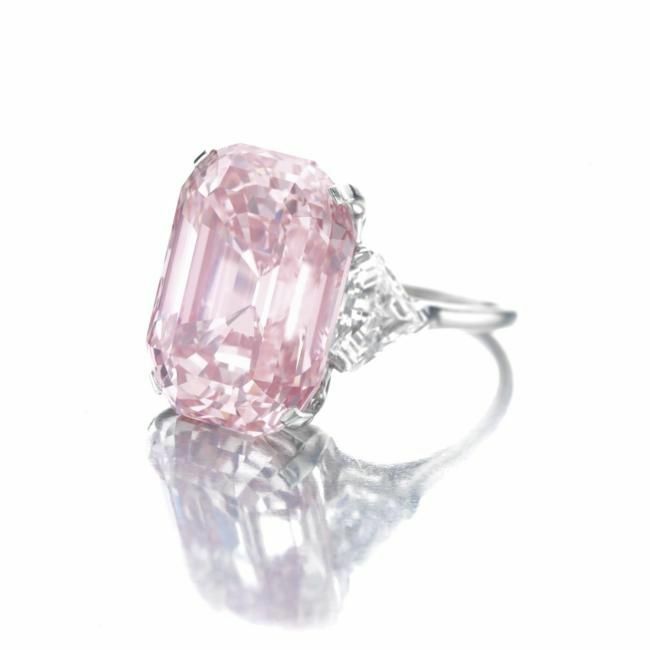 GENEVA - A rare pink diamond has broken auction records after being sold for $US46.2 million ($47.2 million), auction house Sotheby's says. 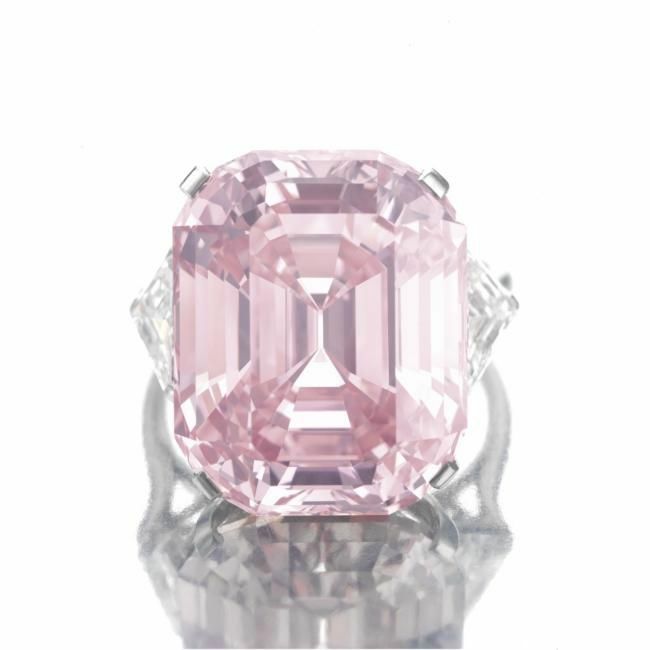 Sotheby's had valued the 24.78 carat 'fancy intense pink' diamond, regarded as one of the most desirable and beautiful in the world, at $US27 million to $US38 million ahead of the sale. But intense bidding wiped out the record of just over $US24 million set during an auction in December 2008 in the sale of a grey-blue Wittelsbach diamond. "At 40.50 million francs, the world record price. Selling it. Sold," the auctioneer said. The final price of over $47.2 million includes the hammer price and the commission. 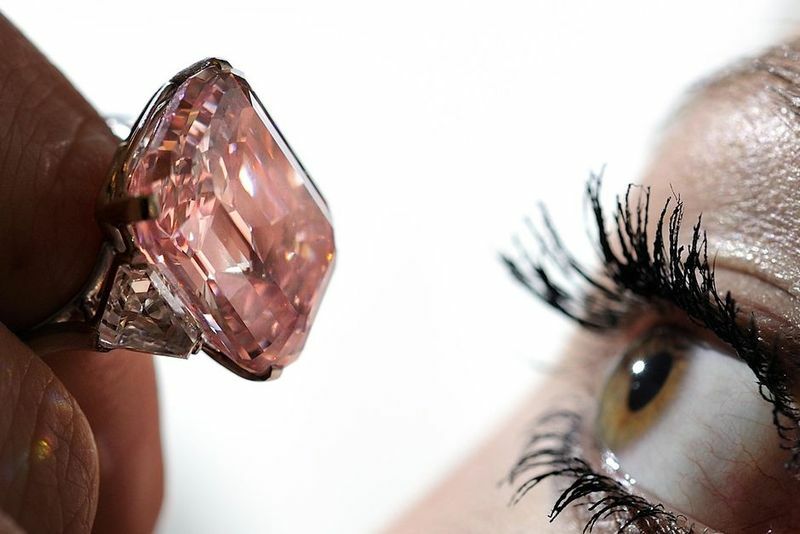 Sotheby's has named the buyer as Laurence Graff, a London-based diamond dealer. Accompanied by GIA report no. 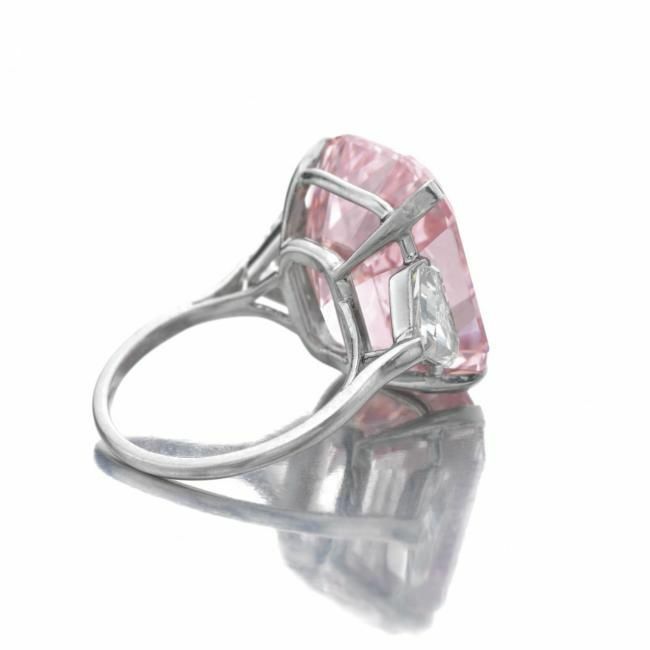 2115100354 stating that the diamond is Fancy Intense Pink, Natural Colour, VVS2 Clarity, together with an additional GIA worksheet stating that the diamond may be Potentially Flawless after repolishing. This stone is being offered for sale from a private collection. According to the consignor the stone has not appeared on the open market since it was first purchased some 60 years ago from Harry Winston himself. This sublimely beautiful stone is without doubt one of the most important diamonds ever to appear at auction and its appearance is a major event in the world of fine gems. All connoisseurs will agree that it displays the most perfect pure pink colour, which has been graded 'fancy intense pink' by the GIA with no secondary colour modifier. In addition the GIA state that the stone may be potentially flawless after polishing away some minor surface defects, which are mainly due to wear and the age of the stone. This exceptional diamond has also been found to be part of the rare subgroup – comprising less than 2 % of all gem diamonds - known as type IIa: stones in this group are chemically the purest of all diamond crystals and often have extraordinary optical transparency. 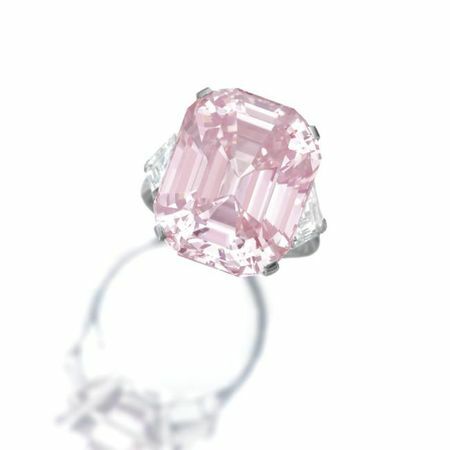 What makes this diamond stand out as a truly rare gemstone however is the combination of this exceptional colour and purity with the classic emerald cut - a style of cutting normally associated with white diamonds and immensely sought-after when found in the rare colours such as pink and blue. The shape is further enhanced by the gently rounded corners which impart a unique softness and charm to this truly outstanding gemstone. Historically, the most famous pink diamonds have come from India. Of these, pride and place must be given to the rectangular, step-cut 'Darya-i-Nur' (Sea of Light), one of the great diamonds of history. The 'Darya-i-Nur' is estimated to weigh between 175 and 195 carats. It is the principal gem in the Crown Jewels of Iran and together with the 'Nur ul-Ain' (Light of the Eye), an oval brilliant of around 60 carats, once constituted the major part of the 'Great Table' diamond. In 1642 Tavernier saw, and tried unsuccessfully to buy, this legendary stone from a merchant in Golconda. Another historic Indian diamond is the 'Agra' which weighs just over 32 carats. Its early history links it with Babur, the first of the Mogul rulers. Later it came into the possession of the eccentric Duke of Brunswick, one of the 19th century's most important collectors of unusual diamonds: he paid 348,000 francs for the gem. Towards the end of the century Edwin Streeter, the London jeweller and author of several books on gemstones, acquired the 'Agra'. 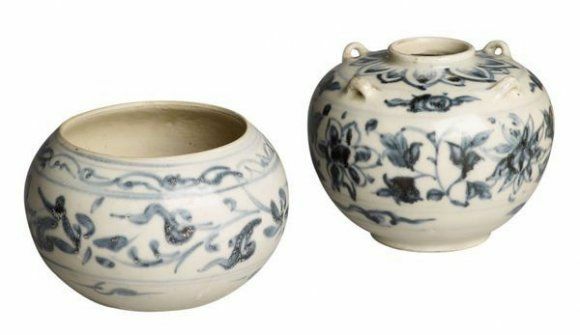 The Agra was sold at auction in London in 1990. The cushion-cut 'Princie' diamond, weighing 34.64 carats, may formerly have been part of the State jewels of Turkey. In 1960 it was sold at an auction in London: shortly after the stone was christened 'Princie' in honour of the fourteen-year-old son of the Maharanee of Baroda whose pet family name was 'Princie'. GENEVE, 16 novembre 2010 – Hier soir, dans le cadre de la vente de Haute Joaillerie de Sotheby’s Genève, un magnifique diamant rose extraordinairement rare, d’une couleur et d’une pureté exceptionnelles, pesant 24,78 carats et certifié « Fancy Intense Pink » par le Gemological Institute of America (GIA) a été vendu pour 45.442.500 CHF/ 46.158.674 US$, un record mondial pour un diamant et un bijou vendus aux enchères. Quatre enchérisseurs se sont disputés ce diamant comptant parmi les plus rares et les plus beaux jamais mis aux enchères et revenant sur le marché après près de 60 ans. Le diamant a finalement été acheté par Patti Wong, Présidente de Sotheby’s en Asie, au nom de Laurence Graff. Juste après la vente, Laurence Graff a nommé le diamant le « Graff Pink » and déclaré: « Au cours de ma carrière, je n’ai jamais vu de diamant plus fabuleux et je suis ravi de l’avoir acquis ».